The US squads both prevailed in round five of the 39th Olympiad in Khanty-Mansiysk. 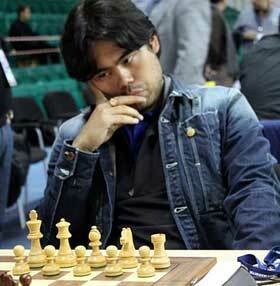 The men defeated Argentina 3-1, spurred on by individual victories by Kamsky and Nakamura. Tomorrow, Sunday September 26th, is a rest day. In round six of the Open Olympiad, the US squad will face Vietnam while the US women's team will face their toughest opponents yet-Georgia. See key round five games below and also check out IM John Donaldson's impressions on the tournament so far. The women scored 2.5-1.5 over Slovenia with Abrahamyan winning the key game. See more details and games on the official site and bookmark chessresults.com for pairings and standings. Photos by Tony Rich of the Chess Club and Scholastic Center of Saint Louis.